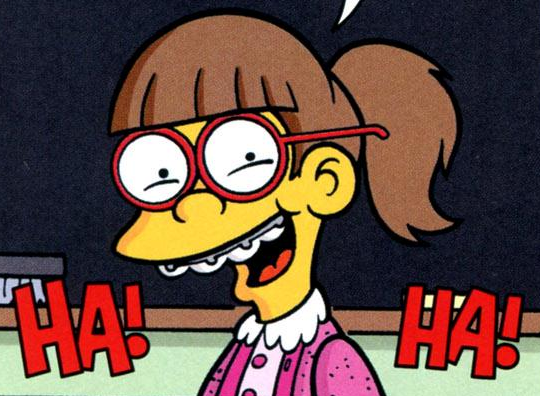 Janet Diddlehopper is a Springfield Elementary School student. 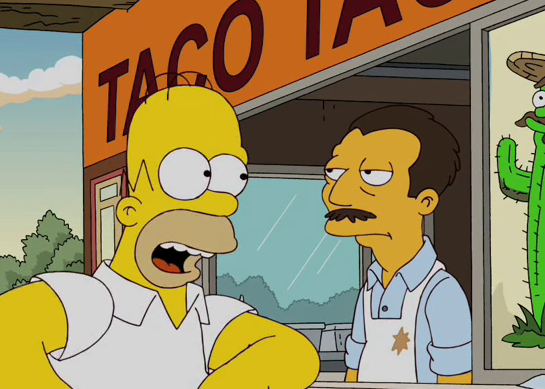 "How d'you say "taco" in Mexican?" This section is in Engrish. Please correct the article, or discuss the issue on the talk page. Bart's class receives a new student, Janet Diddlehopper. After the boys behave badly against her during her first day. teaching decides Edna decides to give an A to whoever takes her to the Arbor Day Box Social. Martin immediately asks Janet if she is interested in Intergalactic Spaceship Quest, because he owns it on DVD. Bart then tries to impress her, claiming that he is the key part of the school's personalty and asks her to go to the dance with him, but Nelson will occasionally take her out to the dance after he told her that his mom's boyfriend has a Harley Davidson after asking he asked her if she likes motorcycles. Bart and Nelson starts then fighting to get Janet on the dancing, Nelson shows how strong he is by lifting nerds, Martin aslso tries again and tells her more about his DVD box but Bart show then his skateboards skills. Nelson shows then how good he is at arm wrestling and Bart gives her an extra lunch which do so Nelson gives her the geeks finished homework. Next school day telling the morning announcementthat Nelson sleeps with a teddy bear, Mr. Frou Frou. Nelson becomes then angry and thinks beating down Bart but Janet stops the fight and tell them that she has decided who she want to dance with and asking them both to come to the dance. Nelson and Bart waiting for Janet and argue why Janet would choose just them, after a while she comes with Martin who is her cavalier because she likes Intergalactic Spaceship Quest and he was the only one who had sometime she liked. Nelson and Bart are surprised because Martin did not need extra credit, he tell them at he now feel more alive. Milhouse then pass them and tell to Nelson and Bart it's good anyway that Janet is comfortable with the new school for that was what they was about, Bart and Nelson becomes angry and pushes away him after they telling him at he did not know anything about girls. Modified on January 31, 2013, at 15:54.